Aroher Hill is the 1185th highest place in Ireland. Picture from markwallace : Looking back to Aroher Hill. Buckoo is the big hill behind it. Picture: Looking back to Aroher Hill. Buckoo is the big hill behind it. 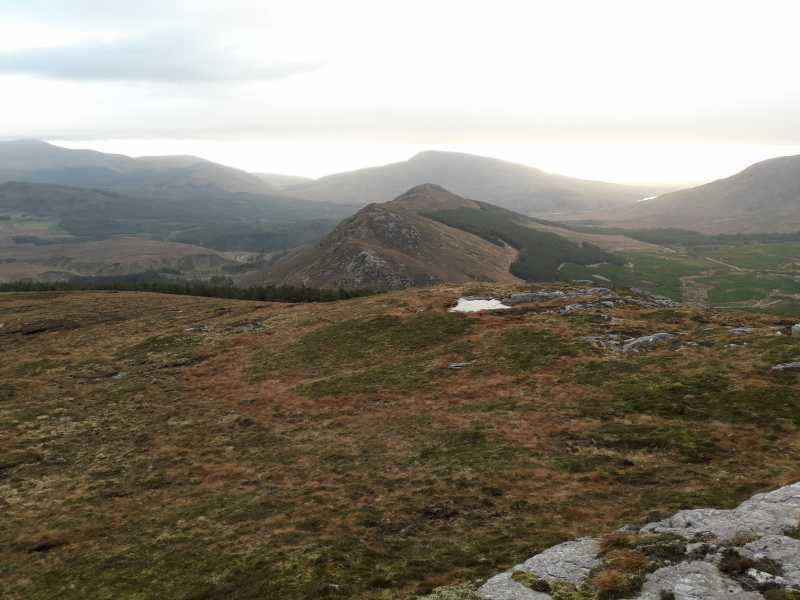 Aroher Hill (called Correen More on EastWest Wild Nephin map) is just off the Western Way at Letterkeen, and can also be quite conveniently included in an ascent of Nephin Beg from the RL Prager Centre (formerly the Brogan Carroll Bothy). If taking the Western Way northwards from the car park at the Centre, after just under 2 kilometres, shortly after passing a barrier, take the first available break in the trees (around F964 073 C) and start climbing the steepish, boggy hillside. There are crags off to the left, but there’s no need to go near them. An ascent of 180 metres takes you to the top of the hill, which has neither cairn nor other marking. Then the kilometre-long ridge heading northwest can be followed towards Nephin Beg. Initially, it’s a pleasant ridge walk with expansive views to each side, as well as a good view of the route forward to Nephin Beg. Then there are a series of short drops, each over exposed rock which has to be gone round or scrambled down, and is quite slow going. Finally, at the col with Correen Beg (according to EW. Not an MV-listed summit, but a useful point of reference for climbing Nephin Beg), you pick up the Letterkeen loop track, albeit doing it in reverse. The track leads straight up to Correen Beg through a break in the forest (this break is clearly visible ahead as you descend from Aroher Hill). The photo shows Aroher Hill from Correenbeg. Note the steep ground and exposed rock on the descent.